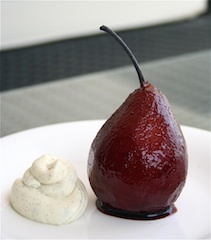 I love poached pears in red wine.. The color, texture and the taste are just out of this world! And with the vanilla flavoured mascarpone it's just a dream come true.. I like serving the pears whole because they look gorgeous, but you can cut them in half if you wish.. In a pot combine the wine, lemon juice, water, sugar, cloves, cinnamon, nutemeg and pears.. Bring to a rapid boil then reduce heat and let it simmer for about 30 minutes or until the pears are tender.. Gently turn the pears once in a while so that all sides get poached equally.. In a bowl combine mascarpone, seeds of the vanilla bean and honey.. Whisk everything together and leave it refrigerated until you are ready to serve.. When the pears are ready, take them out of the pot but continue simmering the wine mixture until it reduces to half.. Once that is done you are ready to plate.. Place the pear on the plate, drizzle it with the reduced wine and serve with a spoon of vanilla mascarpone! Beautiful!